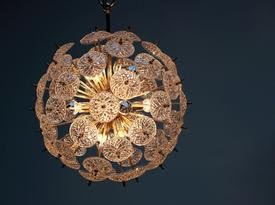 It's the Pearl Lotus Flower Chandelier from VivaTerra and depending upon the size is either $329 or $649. On another note, I'm so behind on my emails & my blog reading and am really sorry if you've emailed me & I haven't gotten back to you. (Just trying to stay afloat over here with the new little guy.) Please feel free to email me again if you had a question I didn't answer. that light fixture has been on my want list for like 2 years. so love it. As you probably know, you're one of the first blogs I go to everyday, & am always so happy to see a new one!!! BUUUT, um, welllll, I would T*H*I*N*K that everyone knows you're JUST a BIT busier right now than Santa is on Christmas Eve!!! !~~~ So, please don't worry about "keeping up", so to speak... babies are only BABIES once, & for suuuuuch a short, oh-so-precious period of valuable time!!! Hugs to the wee one, & keep some for yourself & the rest of the family! Great find! I would love to use that chandelier in my home and think it would be cool in my dining room! Oh, this is so awesome. So, so awesome. It makes me want to find dollars I don't have to hire you as my designer simply so we can find SOMEWHERE in my home for this. L.O.V.E. take as much time as you need with your new little guy. we totally understand! i was out of commission for weeks and weeks when i had my little one, just cherishing every second. and as for that light...FABULOUS! It's a good one...for many different rooms!!! 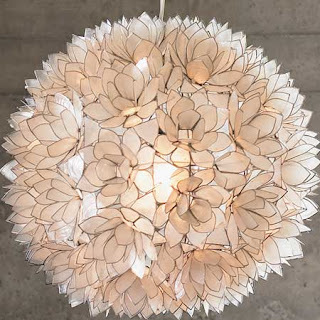 I've been in love with this light fixture for ages! reminds me of those milk weeds that we pick and then blow them scattering all those pods about. pretty light deserves a blow-out party! That chandelier is breathtaking. My goodness! i have a cheap version of this chandelier i got at target ($75?) a few years ago! we hardwired it & it hangs above my kitchen table. although the details aren't as pretty as those posted, i love it! i will try to figure out a way to post the pic. Love your blog! Great light fixtures. I'm sure no one will mind if you can't get to your email - you just had a baby! When my kids were born I could barely find clean clothes to put on. Here's the pic. Looks blurry but if you view the full size image, you can see it. I love the black/dark gray version! YUM! and no apologies necessary! we all understand. I have had that exact chandy on my want list for a couple of years too! Snuggle with that liitle cozy baby! I looooveeee capiz chandeliers. I have been coveting the one that used to be at West Elm for forever. Beautiful shade of pink...and I'm not a pink person. :-) My heavens, don't even be concerned about emails, etc. Your little ones are so precious and time is short with them. We'll still be here! I would love to use that chandelier in my home and think it would be cool in my dining room! Lauren -- I have this chandelier (in a smoky color) in my dining room! I lusted for it for two years before I finally bought it -- it makes me happy every day. Congrats on your baby -- so cute!